With the valuable assistance of skilled team of professionals, we are engaged in trading an extensive range of high quality Mini Gasoline Water Pump. 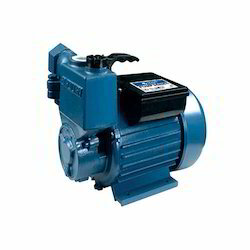 - We are the Manufacturer and Exporter of wide range of water pumps in Coimbatore. - Our water pumps, which have excellent resistance power, are exclusively used in various fields which include construction, farm, industry, domestic etc. - Our unrivaled water pumps proffer high operating efficiency. With sincerity and hard work of our professionals, we have carved a niche for ourselves in this domain by providing a premium quality gamut of Mini Pressure Water Pump. Crompton Greaves Mini Force II (0.5HP) is a valuable water pump, which is manufactured specially to meet the domestic water requirements. It should be used in clear water for long life. The pumps have 6 to 8 meters suction and suited for every home. It is smart enough with compact and sleek looks.